Many donors receive great satisfaction and goodwill when they see what their donations provide. Donations can be made as a single gift or through a monthly/yearly giving program. They can commemorate any occasion, such as a birthday, anniversary or retirement, a get well, a new arrival, best wishes, or for any other purpose. The Walkerton & District Hospital Foundation is a registered not-for-profit charity with a charitable tax number of 89030 9248 RR0001. The Walkerton & District Hospital Foundation is proud to unveil their new cumulative giving donor recognition piece. This new recognition piece is a better way to properly recognize and thank our donors and their commitment to health care. The cumulative giving piece recognizes donors on cumulative giving of $1,000 and up at set giving levels. All donations made throughout the year will be added to cumulative giving totals for this recognition piece. This recognition piece will be updated yearly to reflect all current donations. The cumulative giving recognition piece is located in the Hospital lobby outside of the Foundation Office. 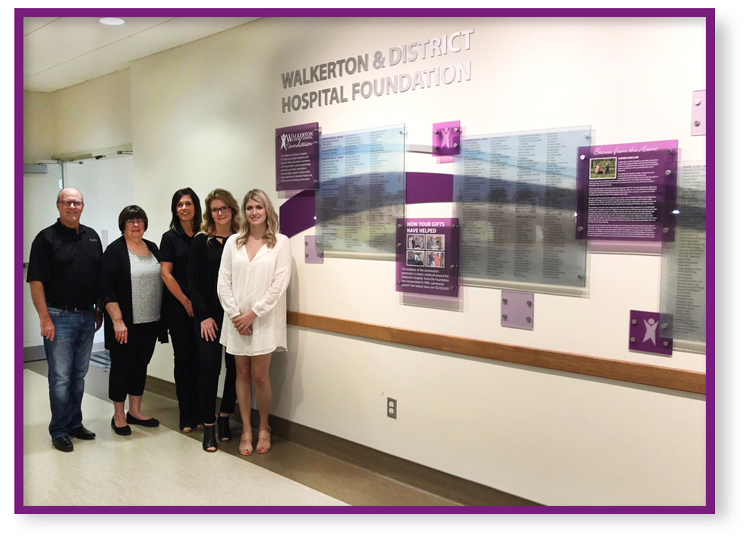 To learn more about the Walkerton & District Hospital Foundation's donor recognition program, please contact the Foundation Office at WDHFoundation@sbghc.on.ca or 519-881-0441.